Road Bike Shorts available in colors, prints and styles to choose. Made in the USA by Aero Tech Designs. Lots of options for men road bike shorts. Aero Tech Designs offers cyclists many different Road Bike Shorts. Many of the road shorts are made in the U.S.A. Our men's spandex shorts will make a difference in the quality of your bicycle rides. We use high quality, stretchy spandex fabrics, high end luxury chamois padding and elite elastics and findings. Give us a try, you'll be happy you did! Feeling Frisky in your bike shorts? Also See our Men's Wild Printed Cycling Shorts and our Men's Cycling Underwear. The single most important part of a men's bike short is the chamois pad. A good chamois pad is designed around the human pelvic region which contains the Ischium bones aka your "sitting bones". The Ischium bones support your body's weight while seated on a bicycle and depend on the density of the chamois pad for proper cushioning. We offer many choices of chamois pads to choose from, ranging from thin to thick. Our Aero Tech Designs bike shorts come in a wide range of chamois pads to help you ride longer and feel stronger. One thing they all have in common is the ability to cushion the saddle area. We designed our men's bike shorts and cycling bibs to be durable and comfortable for the long haul. Gel filled Bicycle Shorts are ideal for beginners and long distance cyclists who need relief from pressure on the rear area. Thin Padded Bike Shorts are great for experienced cyclists who are comfortable on their saddles or for triathletes who want one garment to swim, bike, and run. The thin pads are also ideal for anti-chafe needs. The dense pads we use in most of our Road Bike Shorts are in the elite category and are the best for high mileage and century rides over 50 miles. We also carry padded Bib Short which is a bike short without a waist elastic and is held up with straps or suspenders. Cycling bibs are most often used by experienced cyclists. Road Bike Shorts are usually made from a stretchy spandex fabric. There are several reasons for using spandex in the design of these shorts. The fabrics used for our road bike shorts are usually a six-way, tricot, knit nylon or polyester. The lightweight fabrics are about 5.5 to 6 ounces per square yard. A medium-weight is about 6.5 ounces and a heavyweight fabric would be about 8 ounces per square yard. Nylon/Lycra blends are more rugged and abrasion resistant which means they are long-lasting. Polyester/Lycra blends are cool and wicking for multi-seasonal riding. The reason we use this fabric is primarily because of the freedom of movement and comfort during cycling. The higher the spandex content - the more compression on the muscles. High Spandex content (over 20%) is a sign of compression support for high end bike shorts. The higher the spandex, the more stretchy and supportive the fabric is. This compression massages the muscles to help work out lactic acid and also enhances blood flow to the muscles, which helps reduce fatigue by keeping fresh blood circulating to the working muscles. The leg gripper or leg band is a feature you will see in most of our bike shorts. These grippers are important to prevent the shorts from riding up the legs. During the cycling motion, your muscles are constantly flexing and moving. There is nothing worse than tugging at your clothes to keep them in place during your ride. When a pair of bike shorts rides up on the leg, it creates an opportunity for bunching in the chamois pad. This bunching of the pad can lead to chafing, rubbing, and worst of all, saddle sores. The use of leg elastics prevents the movement of the garment, so the shorts stay stretched and the chamois stays in place. 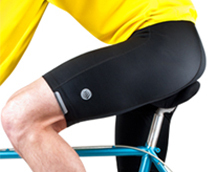 We design our bicycle shorts to include a reflective element on the moving areas of the leg. This makes the ideal location for a reflective because it is visible for a motorist in low light conditions. Road Bike Shorts are to be worn without underwear so the pad is held tight to the skin in the saddle area and you get the most advantage in its wicking ability. Bike shorts work best when they are worn tight so that the lycra spandex supports the working muscles. When you try on a pair of bike shorts, it should not be too tight or binding but fits snug so the chamois pad stays in place. Panels - Bike shorts are often described as 6-panel or 8-panel shorts. Inseam - The length of the leg's inseam is a matter of personal preference. We think the short should be a few inches above the knee. Biking shorts come in Tall (about 11 inches), Short (about 5 to 7) and Regular Inseams (about 8-9 inches). Elastics - Waist elastic is important to keep the shorts in place. Wider elastic has less tendency to roll. Some cycle shorts have a drawstring, especially shorts for multiple uses like triathlon and fitness. A drawstring is not essential for road shorts, but may come in handy. Cycle shorts should fit snug with the pad close to the skin or potential benefits of wearing them will be negated. A correctly sized pair of road shorts is essential to make sure that you get the most out of them.. When looking at the manufacturer size chart, you will be able to fit into the size bigger or smaller with varying degrees of compression. We suggest the use of the manufacturer's size chart. If you want the garment to fit you loosely, you can go up a size. Cycling Shorts should fit snug. Men's Padded Bike Shorts need to be laundered each use. The best way care for road shorts is to machine wash and air dry. We recommend machine washing to remove all of the bacteria from the chamois pad. The goal of clean shorts is to prevent the buildup of bacteria on the chamois pad, which can lead to saddle sores. Saddle sores are a cyclists worst enemy. Air drying the spandex shorts helps the rubber spandex fibers to last longer without drying out. Men's Padded Bike Shorts are worn "without underwear". We highly recommend the use and frequent application of an anti-chafe cream for long distance rides. Put the cream on your skin, between your legs and all over the chamois pad. Squeeze a generous portion of the cream on the pad and rub it all over the pad. The lubricant on the pad and your skin will prevent hot spots from abrasion. On long bicycle tours or long daily distances, this cream application may be essential to enhance riding comfort.